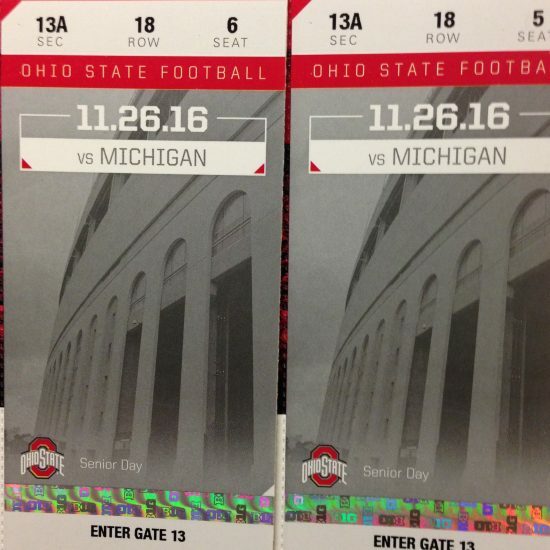 Adyn’s Dream Raffling Off 2 A-Deck Ohio State vs. Michigan Football Tickets! Adyn’s Dream is excited to announce a new raffle for anyone who is (or knows) a fan of the Ohio State Buckeyes or Michigan Wolverines! 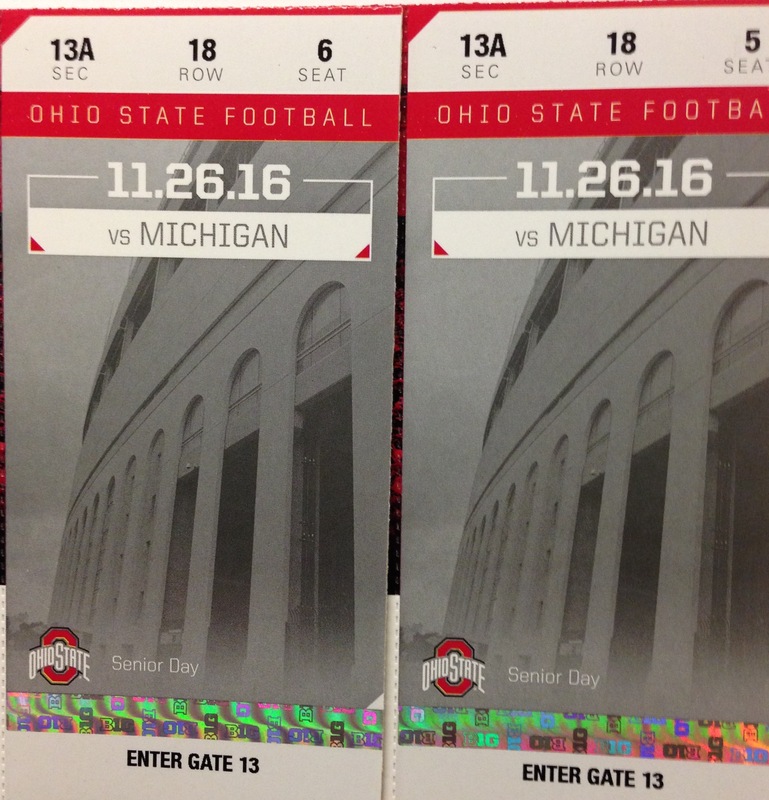 We are raffling off 2 incredible seats for this college football’s biggest game of the season – Ohio State vs. Michigan on November 26, 2016 in Columbus, Ohio! This is slated to be one of the best games in recent history between these 2 powerhouse football programs. In fact, nearly every pre-season prediction has both Ohio State and Michigan in the nation’s top 10 … this will certainly hold true throughout the season – making this meeting in November one of incredible importance! These tickets will most likely be worth thousands of dollars by game time … now you can have your chance to win these tickets & support families with children born with Spinal Muscular Atrophy at the same time! Every dollar raised in this raffle (as well as every Adyn’s Dream event) goes to help these SMA families! Just click HERE to purchase your raffle tickets online. You can choose the following options: 1 raffle ticket = $15, 2 raffle tickets = $25, 5 raffle tickets = $50. If you’d like more than 5, simply add the units you’d like to your cart before checking out (i.e. – you’d like 7 tickets, so add 1 unit of the “5 tickets” option & then 1 unit of the “2 tickets” option … then check out. You’ll have 7 tickets for $75). If you have any questions, please contact us at adynsdream@gmail.com or call us at 740-501-5784. Once we receive your order, within 24 hours we will send you an email (make sure your email is valid) with your raffle numbers & a picture of your tickets. On Sunday, November 20th, we will live broadcast the drawing on our Facebook page (click here to find our page), immediately contact the winner via email, and then overnight ship the tickets to them on Monday. Tickets will be received by the winner on Tuesday, November 22nd. Please make sure to include a valid shipping address (no PO Boxes), email and phone number with all orders. Thank you for your support of Adyn’s Dream. We are a 501(c)(3) certified nonprofit based in Athens, Ohio that provides support to families with children born with Spinal Muscular Atrophy primarily through hosting a variety of live music events. Follow us on Facebook, Twitter and Instagram to stay up to date on our events! ← Announcing the Adyn’s Dream Bluegrass @ Little Fish Fundraiser on Sunday, 9/25!